If your ancestors lived in the East Essex area there may well be traces of their lives still in place from local memorials and other records. This type of information can put some flesh onto the basic information contained in census returns and other centralised information. This web site was developed due to the high number of genealogy enquiries received at the local directory sites www.burnham.org.uk and www.dengie.org.uk that offer extensive up to date information about the area. Additional information will be welcomed from people who wish to add/ amend existing pages or add new pages. That is especially true of lists of names such as parish rectors, councilors, land owners etc so important to people trying to trace their family tree. What area does this site cover? 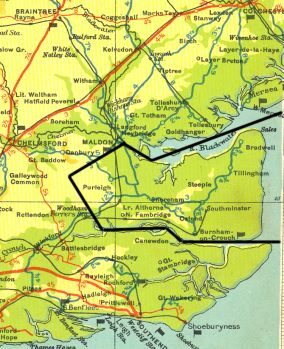 The geographical area covered by this site is the rural area of Eastern Essex sandwiched between the Towns of Chelmsford, Maldon, Wickford and the coast. What can I find on the site pages? There are over 130 pages on this site containing details of thousands of people and the background to their lives. Access is via the buttons at the top of the page. History of the District - Whilst there are many sites on the internet that provide general details of life at various times in history life varied considerably in different parts of the country or even different parts of a county. Try clicking the history of the district button above attempt to provide a feel for life during many periods of history and though many traumatic events in this small corner of rural England. Local Family History - Genealogist throughout the world have published names that they have uncovered during their research. By clicking on the local family history buttons a number of lists containing names of people and businesses are available. These pages include details from war memorials, trade directories, church records, taxation records,birth,marriage,death records and many more rich sources of data for genealogists. Beginners Tips - Newcomers to genealogy can reduce the steep learning curve that they face by visiting the beginners tips pages. Lookup and Photo Services - Unlike our ancestors who spent most of their lives in a small area , families are now spread throughout the world. To help people who are unable to complete their research locally the site is able to offer lookup and enquiries and well as old local photographs although there is a charge for these services. Vintage photos for sale - Nothing adds to your family history record like photographs of your ancestors home town taken as they would have known it. The vintage photo pages offers the change to obtain copies of photos taken from 1899 onwards. What's not on this site? If you are seeking information about other areas of Essex or information not recorded on this site a visit to the links page will offer links to site such as the Essex Family History Society site is operated by a grouping of experts on Essex genealogy or Cindy's list which is the biggest directory of genealogy links on the net.